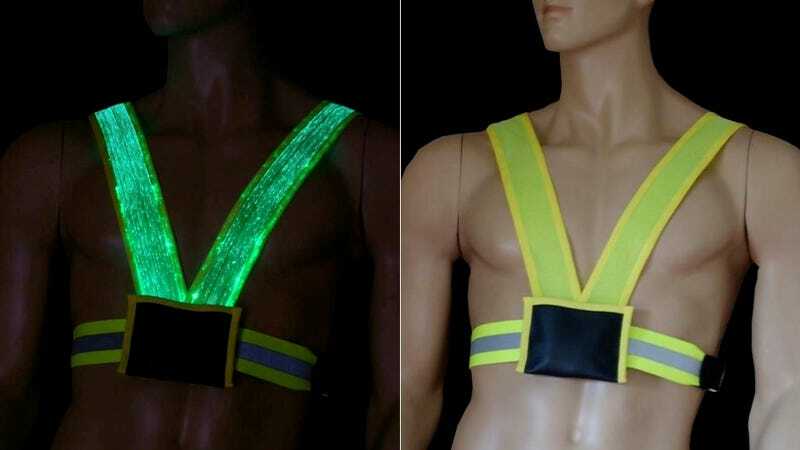 Will the Buff, Shirtless Crossing Guards of the Future Wear High-Tech Glowing Safety Vests? The visionary fashion designers at LumiGram have done it again. Their new safety vests are a modern spin on the gear crossing guards wear as they protect street-crossing children on the way to school. The battery-powered fabrics are made of super-thin optical fibers woven in with other synthetics. The fibers are connected to LEDs, which shoot light throughout their lengths, giving the vests an eerie glow. It's easy to imagine other applications—bikers out for a nighttime ride, roadside joggers in need of a can't-miss-it beacon, or just regular folks wanting to look like something out of a sci-fi movie. Smart design saving lives. We LOVE it.